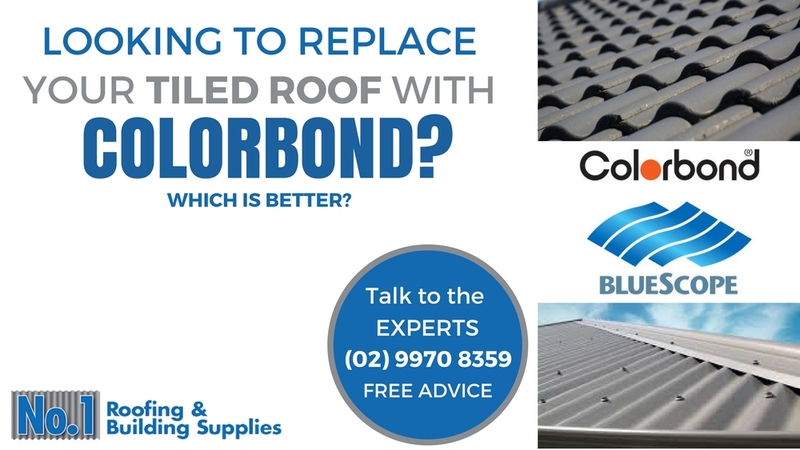 Looking To Replace Your Tile Roof With Colorbond, Which Is Better? ﻿What Are The Benefits﻿ ﻿of Colorbond vs Tile Roofing? ﻿What Does It Cost To Replace A﻿ ﻿Tile Roof With Colorbond? ﻿﻿Is Colorbond Roofing More Difficult To Install Than Tiles? 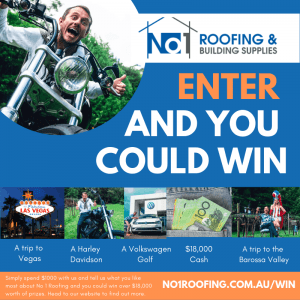 Will Colorbond Roofing ﻿Increase My Property Value More Than Tiles? How Do I Choose The Right Colorbond Product? Roofing is a very important part of your home and represents a substantial financial investment so when it comes to replacing your old tile roof you need to get some solid advice. Concrete tiles have been used on Australian homes for some 70 years but Colorbond metal roofing has also built a solid reputation for durability and dependability. 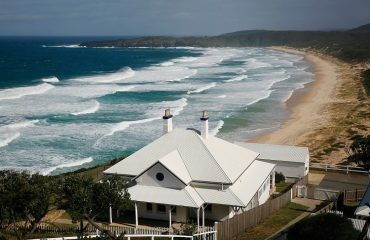 ... is it better to replace your old tile roof with tiles or covert your tile roof to Colorbond steel? Costs - price difference between Colorbond and tile roof? Risks - do tile roofs require more or less maintenance than Colorbond? Installation difficulties - which is easier to install? Resale / property value - will a new Colorbond roof increase the value of my property more than a tile roof? Choosing the right type of Colorbond product - what else do I need to know about Colorbond versus tile roofing? Getting qualified / experienced trades people - who can I trust to install my Colorbond roof correctly? 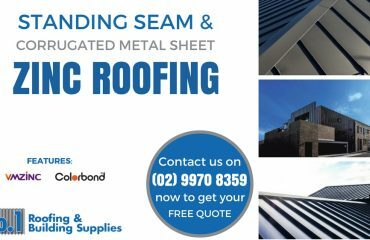 No.1 Roofing and Building Supplies is one of the largest suppliers of Colorbond roofing materials and accessories in the Sydney area and our outstanding expert advice and access to premimum installers is second to none. 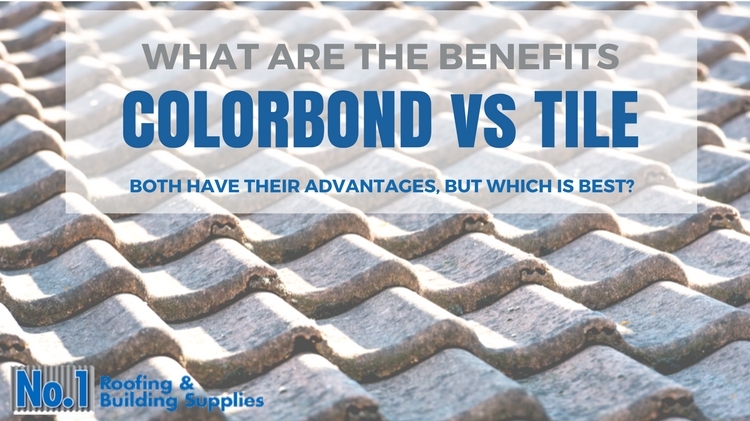 What Are The Benefits of Colorbond vs Tile Roofing? Both Colorbond and tile roofs have their advantages and sometimes the design of your roof will actually dictate one or the other. Concrete or terracotta tiles have been used for roofing in Australia for more than 70 years and offer a very traditional look. The first Colorbond products were developed some 50 years ago and the hi-tech manufacturing processes and considerable product development since then have resulted in an outstanding product. Plus, Colorbond is backed up by a solid warranty. Weight - Colorbond is much lighter than tile roofing, as much as 90% lighter. Not only does this mean that handling and installation is easier and faster but the roofing subframe is not subject to heavy loading and you can even use lighter battens and space rafters further apart for another cost saving. 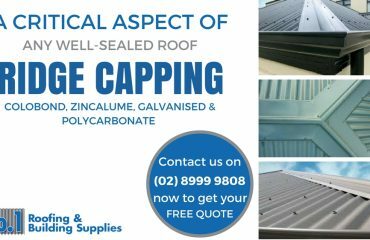 Lifespan - Colorbond roofs can have a life expectancy of up to 70 years whereas tile roofs are easily damaged and prone to cracking under typical Australian weather extremes. Problem leaks also frequently occur round the ridge capping areas on tile roofs. Colorbond ridge flashings are much simpler to install and more reliable. Water collection - older tile roofs absorb a certain amount of water, which not only adds to the weight of the roof but reduces the amount of water you can collect. This may prove critical in times of severe drought. Tiles tend to crack and the resulting dirt build-up encourages the growth of moss and mould that can contaminate your drinking water. With a Colorbond roof all the rain is collected as clean water fit for household use. Maintenance - Colorbond roofs offer a low maintenance roofing solution with a stable surface. Even when maintenance work is needed such as cleaning or repainting there is little chance of damage to the metal roofing panels. On the other hand, tile roofs frequently crack exposing the sub roofing to water damage and allowing a build up of dirt. Simply walking on a tile roof may be enough to dislodge or crack tiles. Heavy tile roofs may even require periodic strengthening or replacement of roofing support structures. Insulation - as a minimum Colorbond Roofs should be installed with a 55 mm thick foil adhered insulation blankets under them. This blanket provides thermal, acoustic and condensation protection. This isn’t the case with tile roofs which are commonly installed with just plain foil or sometimes without even that under them. Design flexibility - Colorbond roofing is much more flexible for designers than tile roofing. That’s why we’ve seen a swing of architecturally designed buildings being specified in metal roofing rather then tiles in recent years. With many colour choices and design options Colorbond roofing is a creative designers dream product. One of the other big advantages of Colorbond steel roofing over tile roofing is that you can install Colorbond on very low pitch or even flat roofs. Tile roofs require an adequately pitched roof angle to avoid leaks. This can be a major consideration when you have height restrictions to work to but need to maximise your building space. What Does It Cost To Replace A Tile Roof With Colorbond? 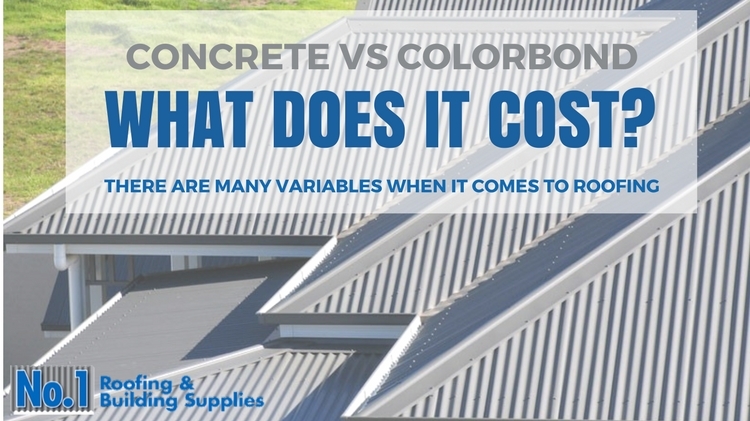 There are many variables when it comes to costing any roof. The only way to be sure is to seek firm quotes from qualified installers. On average standard Colorbond corrugated roofs will be roughly the same price as standard concrete tiles roofs. The big savings come in over time. Lower maintenance, better insulation, better storm damage resistance and even the potential for lower premiums on your home insurance are what makes Colorbond Roofing the big winner when you put it head to head with tiles. Is Colorbond Roofing More Difficult To Install Than Tiles? Colorbond steel is a breeze to install for experienced trades people. As with any roofing material it’s critical to install the roof in accordance with the building code and manufacturer’s instructions but metal roofs are remarkably resistant to damage from trades people walking on the panels or other damage. The lightweight and cut to length properties of Colorbond Roofing mean that large areas can be rapidly installed by fewer people so you minimise the exposure of your property to multiple people – which in turn reduces the risk of damage. – tile roofing teams tend to be larger then metal roofing teams – which increase the risk of damage to your property during installation. – which means that they can be easily damaged by follow on trades like antenna installers. Tile pointing and roof capping can also be challenging areas when installing tile roofs and require very careful attention. 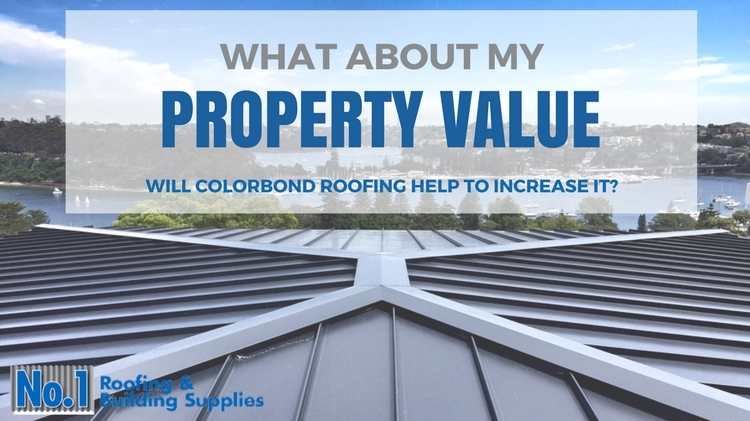 Will Colorbond Roofing Increase My Property Value More Than Tiles? ... and Colorbond roofs are seen as increasingly desirable by potential property buyers. Personal preference will always play a part in determining property values and terracotta tiles can look really smart on particular styles of houses but Colorbond roofing is becoming the roof of the future. So, in short, replacing tired old roofing tiles with Colorbond is going to add a real boost to your property’s value. Colorbond steel has been tested and designed for Australian conditions and it’s made right here in Australia. Once you’ve decided on the appropriate Colorbond steel for your location your toughest decision will be to choose from the amazing Colorbond colour range. Who Can I Trust To Install My New Roof? If you are wondering, “tile roof versus Colorbond, what’s better?”, you need to talk to us. If you are ready to install a Colorbond roof or replace your tile roof with a Colorbond one – contact us and we will assist you find the right roofing contractor for your project.